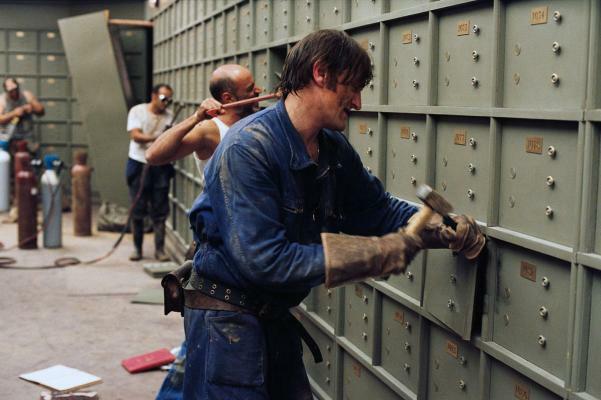 While most of France was enjoying the long holiday weekend of 16-19 July 1976, a group of thieves was emptying several hundred safety deposit boxes in the vaults of the Societe Generale bank in Nice. They contained about 50 million francs in cash, jewels and other valuables. The thieves had spent the previous two months building a 7.6-m (25-ft) long tunnel into the vaults. Once they had finished, they welded the vaults closed. When the staff arrived for work on Tuesday 20 July 1976 they assumed that there had been a malfunction of the time locks. Only when the vaults were broken open did they realize that they had been robbed. On the wall was scrawled, “Sans haine, sans violence et sans arme” (“without hatred, without violence, without weapons”). The safety deposit boxes were strewn about the floor amid the remains of gourmet meals, oxy-acetylene torches and, in the tunnel, a pneumatic drill and a cable that they had cheekily plugged into the city’s electric supply. When the story broke, the French were quietly amused by the gall and cunning of the robbers. The people whose property had been stolen were most unamused —especially when they learned that the vault had not been alarmed and that it was a short distance from Nice police headquarters, who had been unaware of what was happening under their noses. Much of the property in the vaults had been hidden from the taxman so was difficult for any insurance claim to be made. In October 1976 the first arrest was made when a garage owner was caught with a bond that could be traced to the robbery. On 27 October 31 men suspected of being involved were arrested. Their leader was Albert Spaggiari (born at Laragne Monteglin on 14 December 1932), a former member of the French Foreign Legion, paratrooper turned photographer and right-wing activist. The other gang members were Nice villains and ex-paras who had been associated with the pro-French Algeria movement, OAS, an anti-De Gaulle organization. On 10 March 1977 Spaggiari appeared in court but evaded the police and jumped out of the window onto the roof a parked car before making his getaway. On 26 April 1978 he was sentenced to ten years’ jail in absentia. On 8 June 1989 he died of throat cancer at Piedmont. The bulk of the loot was never recovered. Just before his arrest, Spaggiari had been on a photographic jaunt to the Far East with the mayor of Nice, Jacques Medecin.